Gift Certificates | 10% Off Gift Cards Today! Save 10% on Gift Cards Today! 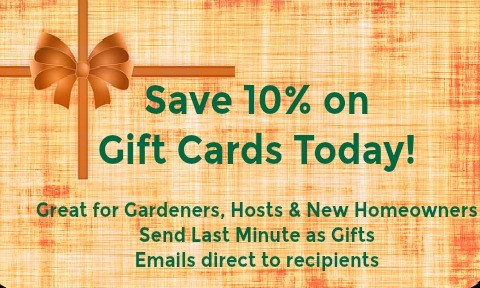 Gardening Gift Cards Make Gift Giving So Easy! Select the amount of the gift certificate, fill in the recipient's name, email address and the message you'd like for them to receive. In the shopping cart you will fill out your name, address, etc. as a regular order. When you have filled out all information an email with the gift certificate code will be sent to your chosen recipient. The certificate will be valid for 1 year. Unless specified here, no discounts apply to gift certificates.